The explosive Audi RS2, all 311bhp of it, is often reckoned to be the world’s first high-performance estate. Certainly it was the first car to combine the practicality of a bigger- booted wagon body with the straight- line speed of a supercar. Thanks to its quattro four-wheel-drive system and punchy turbocharged engine, it was actually faster to 30mph than the mighty McLaren F1, as discovered by this magazine’s road testers in the mid-1990s – but the first rapid estate car it was not. BMW’s E34 M5 Touring had arrived two years before it, in 1992, albeit in left-hand- drive markets only. Another two years before that, Subaru had endowed an estate car with more power than was strictly necessary by offering the Legacy with as much as 197bhp in its home market of Japan. Whether it was Audi, BMW or Subaru that invented the fast estate is a matter for debate, then. But which manufacturer builds the best high- performance wagons in 2018? That we can answer for certain. As the leading proponents of the breed it’s a face-off between Audi Sport and Mercedes-AMG. 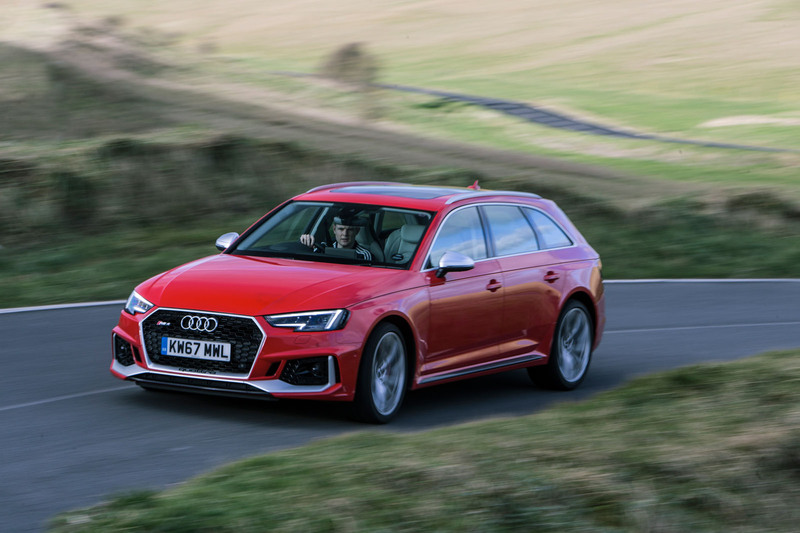 First, we’ll pitch Neckarsulm’s brand new RS4 against Affalterbach’s C63 S, before lining the RS6 up against the E63 S.
Only then will one of these German companies be crowned king of the crushingly fast estate car. There is something about this RS4’s Misano Red paint, in direct sun at least, that does it a disservice. It seems to flatten the topography of the bodywork, those squared-off box arches getting lost in the car’s flanks. The visual muscle seen in photographs seems to have atrophied to nothing. In fact, looking at it in situ, it’s hard to be certain this is the range-topping RS model, but for that modest badge in the grille. The Mercedes-AMG C63 S that’s sitting alongside the RS4 looks pumped- up and purposeful by comparison, despite its demure (and confusingly named) Brilliant Blue paint. But it must be a trick of the light, or that colour. 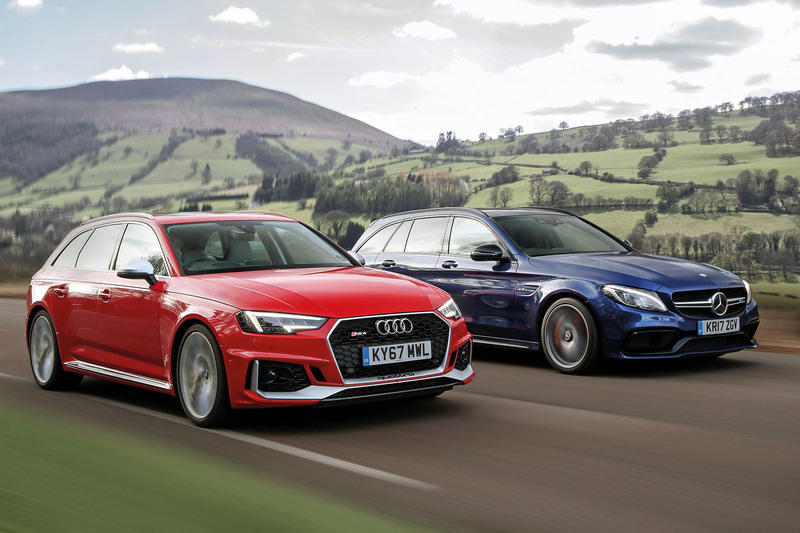 In Daytona Grey or Navarra Blue the RS4 looks as tough and muscle bound as any mid-size estate has ever done. The hue of the bodywork isn’t the only thing that’s a little baffling about the RS4, though. As we’ll see, Audi’s latest high-speed load carrier is just one of those cars that leaves you feeling... unconvinced. Beneath its bonnet the RS4 has come full circle. Between 2006 and 2015 the Mk2 and Mk3 RS4 were propelled by high-revving, normally aspirated V8s, the kind of engine that made you prod the throttle pedal not only for the surge in acceleration but also for the serrated edge to the power delivery and the dramatic, soaring soundtrack. This fourth-gen RS4 junks the 4.2-litre V8 in favour of a twin-turbo V6 – the sameconfiguration of motor that powered the first RS4 back in 1999. Giving up a pair of cylinders and more than a litre of displacement to the AMG C63 S – which, admittedly, is almost £8000 more expensive than the Audi – puts the RS4 at a disadvantage. The Merc’s 4.0-litretwin-turbo V8 is comfortably more potent than the Audi’s V6 – in fact, with 503bhp to 444bhp it’s not even close – and it feels it. Whereas the RS4 is simply very quick, the C63 S has the sort of unrelenting, runaway-train straight-line performance that makes your passengers panic. Sure, the four-wheel-drive RS4 is quicker off the line, but everywhere else the Mercedes emphatically hauls itself off into the distance. More important than its sheer performance advantage, however, is the manner with which the AMG delivers its power. It’s a lunatic, walloping along on a tidal wave of torque, quad exhaust tips spewing forth a torrent of fire and fury, traction control fighting desperately to keep the two driven wheels from roasting the rubber wrapped around them. You put your foot down, hold on tight and – crucially – laugh like an idiot. The RS4? Its engine is perhaps a little more responsive but it offers nothing like the thump to your back. The soundtrack is strained and bland even though this test car, like its counterpart, is fitted with the optional sports exhaust. That’s aside from an odd, occasional whining noise under full load, as though there’s a supercharger up front rather than a pair of turbos. The V6 spins quickly to the limiter, but with all four contact patches sharing a much-reduced load, the Audi simply punts along without a hint of a drama. Effective, then, but entirely forgettable. The RS4 wouldn’t make you laugh if it had just spent a week parked in Billy Connolly’s garage. And yet in some important ways this RS4 is the best of the dynasty. It has balance for one thing, thanks to the new V6 weighing some 31kg less than the old V8 and sitting further back in the chassis. This RS4 doesn’t chase its nose like RS4s of old, and if you over-commit to a corner you’ll just as likely feel the rear end come round as sense the front pushing on. 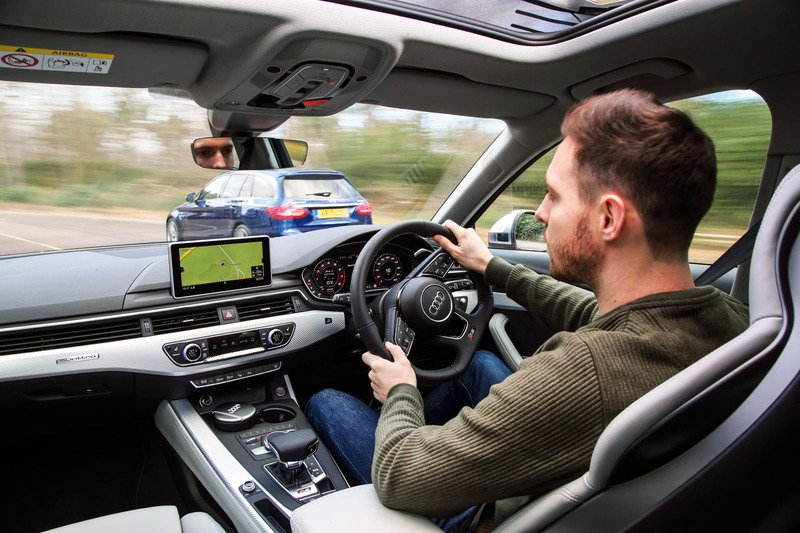 That is a deeply unusual – but brilliant – thing to feel in an Audi estate car. It means the car is less frustrating at the limit than its forebears. Out of a corner it feels positive and agile, too, the RS sport differential diverting drive to the outside rear corner to great effect. The second huge step forward from old RS4 to new is the ride quality. Rolling on RS sport suspension (a £2000 option), the latest model has a plushness to it over rough roads whereas the previous model was tight and unyielding. But despite those very commendable steps forward, it is the C63 S that is the more involving and rewarding performance car. It steers more faithfully, it’s more playful and agile and it’s better balanced still. The ways in which its body moves and rolls in corners makes it easier to read and manipulate at the limit, too, and if you switch the stability systems off it can play the hooligan in the finest AMG tradition. The Mercedes is simply a lot more fun. Does a performance estate really need to be fun to drive, or is fast and competent good enough? Perhaps it is, in which case the new RS4 is a very fine car indeed. But if you happen to think that a £60,000-plus performance car should be in some way engaging to drive regardless of its body type, as we happen to, then the Mercedes-AMG is the clear victor. 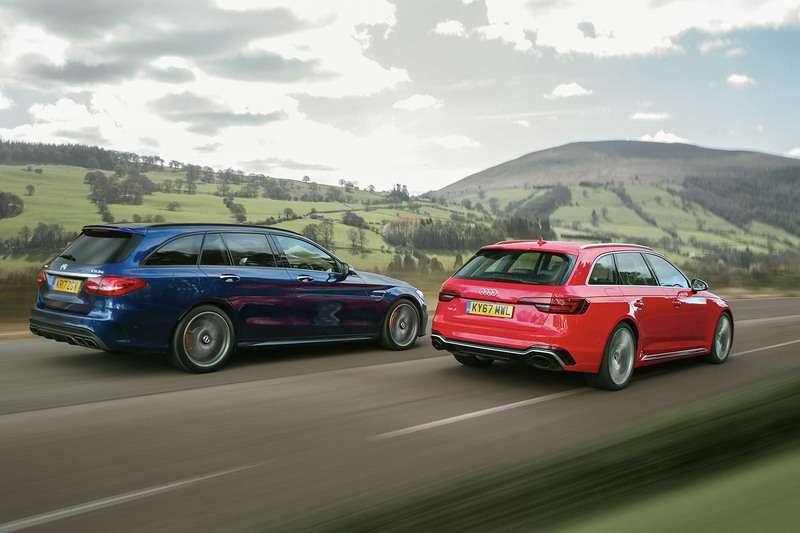 There are two ways in which the Audi RS6 Performance is a better fast estate than the Mercedes-AMG E63 S. The first is that it looks a whole lot tougher, its steroidal arches, low-slung ride height and menacing smoked headlights making the AMG look fussy and generic. To these eyes, at least, the RS6 Performance might just be the best-looking estate yet. The other ace it holds over the E63 S is its fluid, pliant ride quality. Both cars here sit on air suspension, but whereas the AMG always feels somewhat jittery – jarring, in fact, over very rough surfaces – the Audi is always comfortable and composed. 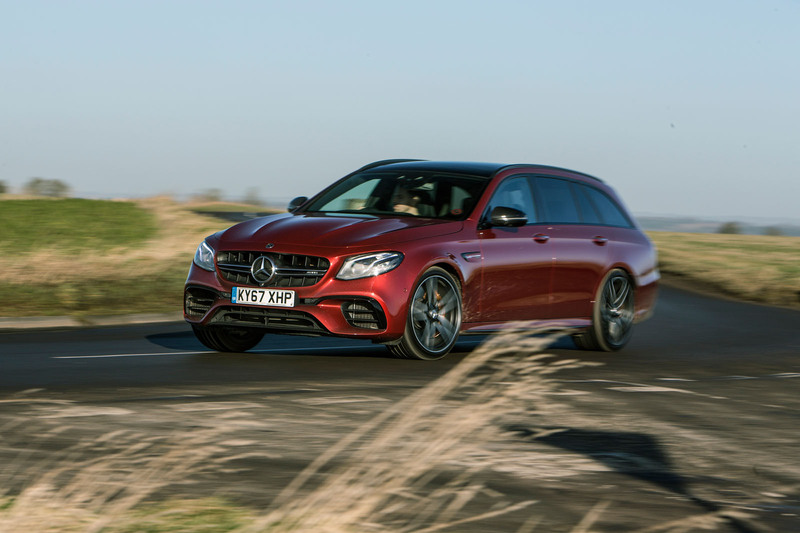 The way a car looks and the way it rides are certainly two of the biggies, but the reality is that in every other meaningful assessment the E63 is the better car by an order of magnitude. Until the AMG arrived, the RS6 was at the top of its game, but when the E63 appeared late last year, the game changed entirely. Its steering, for one thing, is ultra crisp and precise, while the Audi’s is gloopy, vague and inconsistent. The Mercedes has a much more neutral handling balance, too, with the sort of resilient front end that you can really lean on – almost as though it belongs to a much smaller, far lighter car. 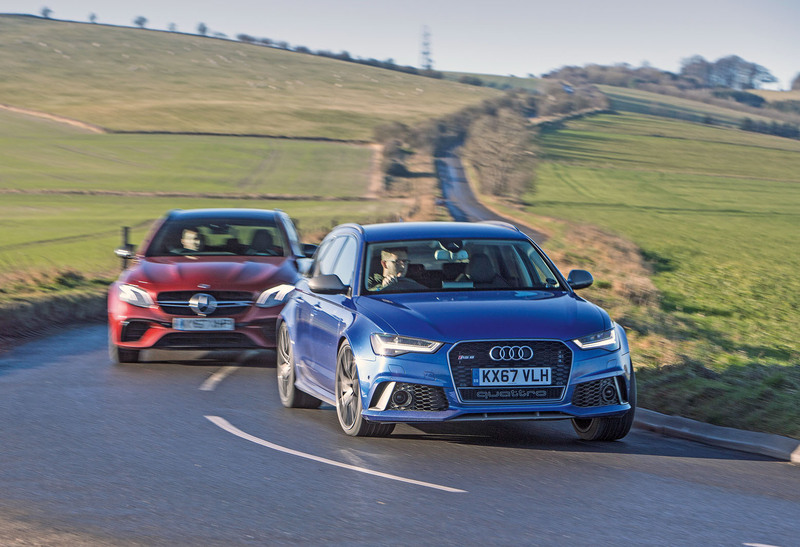 The RS6 pushes on where the E63 S holds on. It’s a similar story on the way out of bends. The Mercedes shuffles its power fore and aft to slingshot itself along the next straight like some kind of Nissan GT-R hearse. You can quite easily persuade the E63 to squirrel its way out of a corner in a faint powerslide, in fact, which is a type of behaviour no four-wheel-drive estate has ever had the chops to exhibit. Time and again, the AMG does things it really shouldn’t be able to. The RS6 Performance can also divert torque here and there with its rear axle’s sport diff, but it never feels as freakishly agile or as malleable as the E63. Both are fantastically quick in a straight line and both have distinctly V8 soundtracks, but the E63’s engine is angrier and harder- edged. Both motors are grizzly bears, but the Audi’s has had its teeth and claws filed down. And as if all of that wasn’t enough, the Mercedes has far and away the better cabin. It feels the best part of a decade newer, which, of course, it is, the A6 this RS6 is based on having been launched right back in 2010. The new A6 is right around the corner; the next RS6 only a couple of years behind it. In the end, then, it’s another comprehensive victory for AMG: two wins in as many contests. And yet, offer me six months in either the E63 S or the RS6 and I’d take the Audi. Well, looks are important, aren’t they? Why do hot estates hold such appeal? Many of us reserve a space in our five-car dream garage for one, often in place of the saloon alternative. The broad range of ability is part of the draw: family bus or Ikea wagon one minute, 911 Turbo chaser the next. But there’s the incongruity, too. An otherwise utilitarian car with 600bhp is brilliantly absurd. And while, say, super-SUVs are more incongruous still, fast estates manage to do it without being hopelessly daft. ... I'd argue that the MB's interior is tech for tech's sake, instrumentation by Casio against the Audi's Breitling - and no, I don't like Audi's virtual cockpit either. As for the E63's ability "to squirrel its way out of a corner in a faint powerslide" so can the RS6. Many's the time I've had to apply a 'dab of oppo' exiting a roundabout - not just on a greasy surface either, happens in the dry too - all with the traction/stability control fully engaged. One thing you don't mention is the overall ownership experience. My wife's MB has broken down three times since bought from new in Autumn '16, to add insult to injury our MB dealer's customer service has been shockingly poor. We're in the process of swapping her car for an equivalent Audi to join mine on the driveway. The Porsche Panamera is pretty practical (I admit it's hard to pigeonhole, but its huge hatchbck is quite estate-like in size) and a very good steer, too! 4WD with lift (air suspension) would even work in Russia. yes their are sufficient oilywhatsits shuffling them around St. Petersburg to make me envious. Agree about it being better all round that the test vehicles but errr the price!!! It seems to me that Audi didn't want to allow the RS4 to outshine the RS6 so they held it back. Hope the next gen RS get the 2 litre engine, or even a straight 5 (which wouldn't need the fake engine sounds). I suppose reviving is too much to ask for. ... or perhaps when the current one is dicontinued, I wouldn't be surprised to see a 'Performance' variant of the RS4 appear with circa 500 bhp. The C8 '6 should have 600+ bhp in 'base' form, rumours are that there will be a performance version with a hybrid-V8 with considerably more. My old Ford C-Max has more space in the boot and a more comfortable driver's seat than either of these ludicrous vehicles. not everyone can afford an RS6. But don’t be bitter. Can't beat a Merc V8. Really glad Merc did well in the group tests here. Faster, more fun and plenty of lunacy thrown in! IMO Audi can't compete and doesn't have the necessary heritage to do so when it comes to these sort of cars.